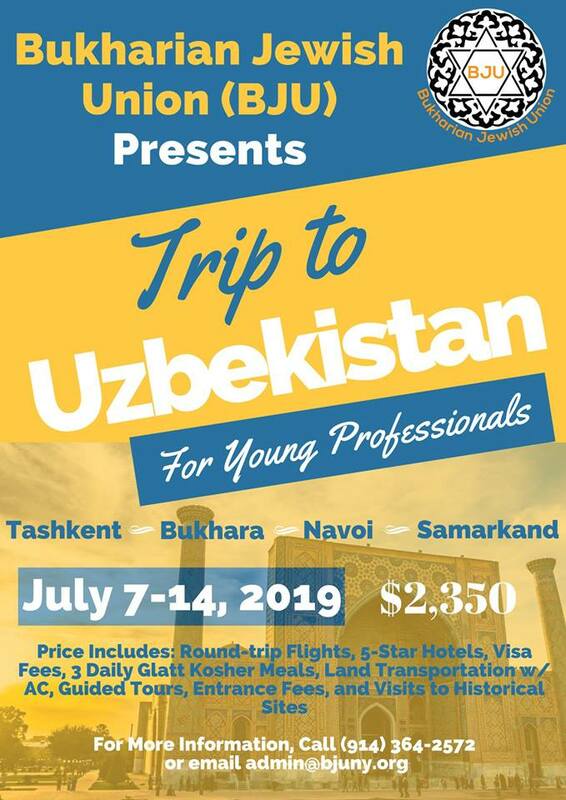 We are thrilled to announce the date for the 2019 Trip to Uzbekistan for Young Professionals in their 20’s and 30’s! This trip will take place from July 7th to 14th, 2019 (7 days). The cities on the itinerary are Tashkent, Samarkand, Navoi, and Bukhara, with stops along major Jewish historical sites. This trip includes flights, visa fees (with US passport), five-star hotels, all transfers, a private coach bus with AC, three-daily glatt kosher meals, fully guided tours, entrance fees to attractions & historical sites, and all taxes. Please note that this trip is organized and facilitated by the Bukharian Jewish Union. To find out more information, pricing, or how to reserve your spot today, email admin@bjuny.org or call 914-364-2572. Don’t miss the trip of a lifetime!